Harrison & Hetherington have today announced details of the second Borderway UK Dairy Expo to take place on Saturday 9th of March 2013. Held at Borderway Exhibition Centre in Rosehill, Carlisle, the inaugural event in March earlier this year attracted in the region of 6000 visitors and an enormous amount of interest from around the UK as a business event. Now in its second year, the organisers are sure this will be a key date on dairy farmers’ calendars and this is an event quite like no other in the north of England. Involving over 150 trade stands, this is an opportunity for breeders and farmers from across the United Kingdom to come together to compete with their animals and discuss business aspects. It is also an opportunity to hear from industry specialists and businesses about the latest news in breeding, science and farm technologies. As the dairy industry grows from strength to strength Borderway UK Dairy Expo aims to showcase the very best in pedigree dairy cattle and the industry that surrounds them. “Following on from the success of Borderway Agri-Expo, the introduction of an event aimed at the dairy farming sector was a great success. 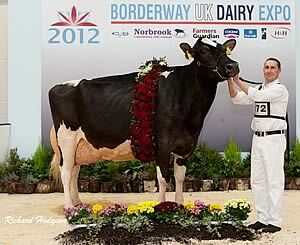 Borderway UK Dairy Expo 2013 is set to be an even bigger success and we hope to see an increase in entries and footfall. This is a chance to highlight an industry that also plays such a huge role in the rural economy aside from other livestock operations, and the show and quality of dairy animals we saw earlier this year was a great tribute to just how far the industry has come”.